Sometimes you just need the dark. Growing up American tinges lives with a cutting, optimistic edge. This is not a value judgment. This is not a universal truism. And this is hardly a new revelation. Plenty of my friends would not describe themselves as optimistic yet there is a undercurrent of Manifest Destiny that informs the fabric of who we are. We have come to expect happy endings. We see ourselves as the good guys and believe that to be true. What strikes me these days is not this aspect of our collective identity but moreso the way it pervades our outlook. Specifically, this train of thought is a recognition of a tug that often pulls on the way we creatively tell stories or expect stories to be told. When we’ve had our fill of comfort and familiarity, an abrasive and unexpected story may be just what is required. A story that uproots blind optimism can be supremely refreshing. Martin McDonagh, the acclaimed Irish playwright seems like a tonic to cure stories with bows and happy endings. Yet, even with his happy ending averted…or inverted, McDonagh retains a moral optimism in all of his vulgar and violent tales. This may simply come down to the characters finally lying in the beds that they’ve made. (l-r.) Brendan Gleeson and Colin Farrell star in Martin McDonagh’s IN BRUGES, a Focus Features release. Now, I’m more familiar with his film work and yet I’ve been told I’ve been really missing out by not experiencing his distinct voice in Theatre. Well if you are like me and need to bath in the absurdly, hilarious darkness of a Martin McDonagh play, now’s your chance. On June 12th, The Breadbox, a company in residence at the EXIT Theatre, opens The Pillowman directed by Ariel Craft. To wet your whistle for a proper cinematic and theater pairing, I reached out to Justin Gillman who is one of the lead actors in this new production. I can’t speak for The Pillowman, which I’m dying to see, but I can say that In Bruges is such a refreshing knockout-punch of obscenity, potent violence, serenely boring beauty, unexpected hilarity and genuine feeling. How McDonagh weaves such a balanced hypnotic net with such deranged and estranged parts, I’ll never know. But I do know that I love this film. Mcdonagh’s second film effort, Seven Psychopaths, while not quite as fully realize as In Bruges is still a captivating treatise on violence and the way we spin our lives into the stories we tell. I hear all these threads twist and turn within The Pillowman. 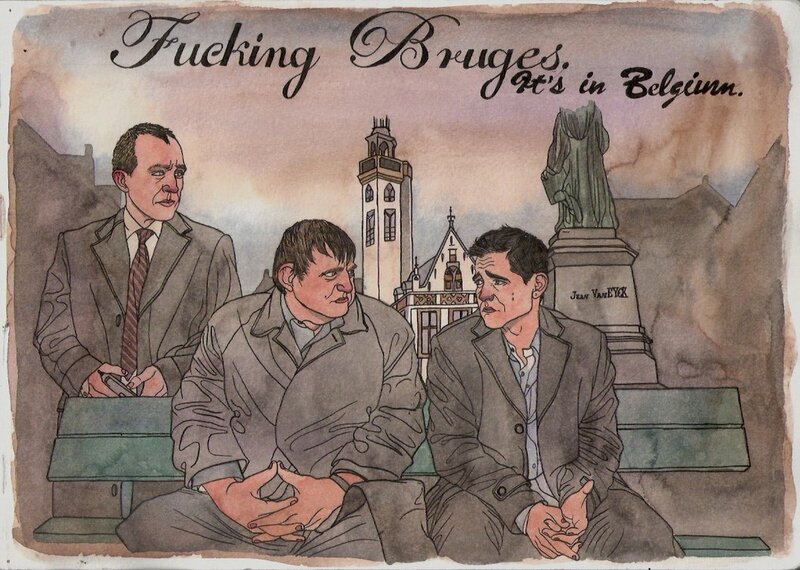 Even with it’s rippling tragic core, In Bruges seems to tie up exactly as it should. It’s the definition of dark and satisfying.